Yesterday, I was walking around in the street, then I saw some children coming from their school feeling very tired. You know why? They were carrying a heavy bag full of books. Is it safe for children? It puts a lot of burden on them. What can we do for them? Today, in this new generation, everyone prefers to become digital. Whether it is making payments or reading a newspaper or books. Our smartphones can carry a lot of information in it if you try to explore. Taking the above example, an app is introduced to help you or anyone else who love reading books. It’s called Book Scanner Pro- A Smart Book Scanner with OCR. The app has been developed by ABBYY. It is a smart pocket scanner for books. It is compatible with iPhone, iPad and iPod touch. It requires 8.0 or any later version of the Operating System. With Book Scanner Pro, you can create an ebook on your iPhone or iPad and make their perfect digital copies of paper in PDF, JPEG, EPUB or FB2. It has a very simple procedure. You can take a picture of book pages and the Book Scanner will split the picture into two separate images and correct any distortions and lighting defects. It will then unbend any curved lines as if you pressed the book. You can select Best-shot photo mode on the viewfinder and it will choose and process the best of the images captured. It has a 3D Touch and Spotlight search which enables you to find scans directly from the home screen of your iPhone or iPad. Book Scanner Pro has excellent graphics and awesome visual quality. It helps you to auto-capture the page boundaries and process scans in color, greyscale or black and white versions. It creates multi page documents up to 100 pages per book which you can edit and enhance quickly and easily. Book Scanner Pro is the need for today’s generation, whether you are a researcher, a student or a reader. 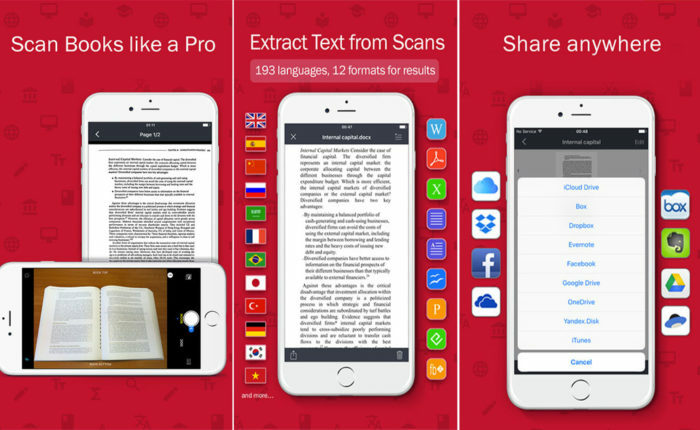 It can recognize text (OCR) on scans in 193 languages, including Latin, Cyrillic and CJK alphabets. Maintaining the original document formatting such as lists, tables and headers, it chooses from among 12 output formats. It has a built-in file storage, which saves scans inside the app. Now, get rid of the old methods because Book Scanner Pro print out scans directly from your iPhone or iPad. You can share and export your ebooks via email and save your document in cloud storages. To secure your document it has a password protection facility which enables you to prevent your document with a password while exporting and sending via email. You can buy Book Scanner Pro from the iTunes now! create ebooks in different formats; perfect visual quality; supports 193 languages; multipage docs; 3D light and spotlight search; built-in storage; password protection; easy to use.